Atlasware - Software to Make SSD easier than its ever been. Helping clients just got a little easier. Atlasware Cloud has made the disability claims process faster and easier than ever. Atlasware Cloud allows you to access the Social Security electronic records exchange (ERE) seamlessly and quickly. With a few clicks, you can instantly request to upload and download disability files, see your full book of business, or schedule automated downloads. Streamlined, innovative, and secure, Atlasware Cloud is the future in disability cloud computing. Best of all, if you have an internet connection, it can be accessed from any device, anywhere in the world. 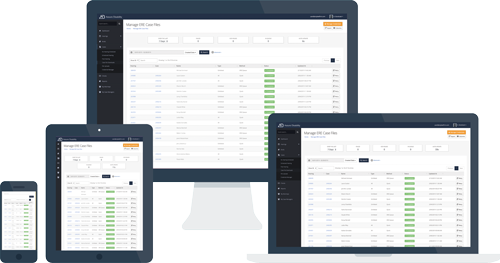 With increased speed and security, firms can view, edit, download, and upload files from a laptop, tablet, or smartphone from anywhere in the world. No need to log in to the SSA website, let Atlasware Cloud handle all the uploads for your firm, including a confirmation that the upload was successful. 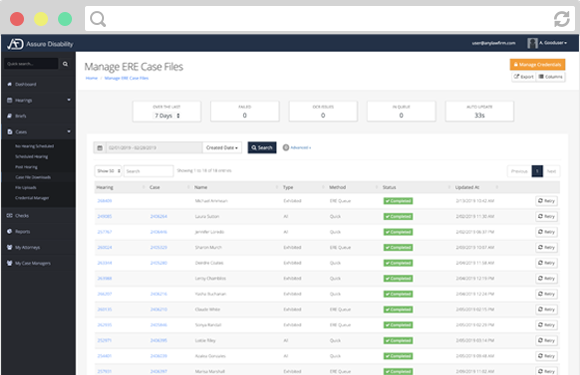 Atlasware Cloud provides scheduled automatic downloads of case files, which are ready to access every morning. Atlasware Cloud offers Brief Pro Plus, a brief wizard tool which guides you step by step through the brief writing process to write organized, concise briefs. Ready to take the next step? Let us help. What are people saying about Atlasware? Atlasware is a program that I have no problem recommending to anyone that does Social Security Disability work. This software allows me to effectively use electronic files during Administrative Law Judge Hearings. Once you use the program once, you see how valuable it is to have page and exhibit numbers on the top of every page and to have the entire client file within one easy to manage pdf. Atlasware has allowed me to easily use client PDF files on my iPad for prehearing review, and to use my iPad effectively during hearings. The beta software has worked flawlessly for me, and I will have no reservation about purchasing this software when it becomes available again as a paid product. I was fortunate to see you and the other Atlasware people at the San Antonio NOSSCR conference and learn about your new program. I have been an Atlasware user for several years, but some of the ODARs have stopped sending file discs and the downloaded PDF files from the website were very cumbersome to deal with. The new Atlasware program that converts the SSA zip files into easy-to-use PDFs has saved me a lot of time and made my file reviews much easier. There have been no bugs or problems so far and the program is very appreciated in my office! Stephen Jackel, Law Office of Stephen M. Jackel. I have been representing Social Security Disability claimants for 20 years. I am a sole practitioner so efficiency is essential. Since I began using Atlasware Software a year ago, it has become an essential tool in my office. I found the downloading of ERE files to be burdensome and the files themselves to be difficult to navigate. I now download all of my ERE files using Atlasware Software, OCR them with the Software, and use them in preparation for and at hearing. The files are easy to read as one continuous document but are easy to maneuver within from one point to the other. While reading a file, the exhibit type, number and page are always displayed. The OCR feature works well. And, when a page or set of pages from the file are printed, they are automatically labeled by exhibit type, number and page. I appreciate the time that Atlasware saves me and my staff on a daily basis. Thank you! This has honestly changed the firm, we’ve been waiting for the day that the files being downloaded online would have a title page. I love this tool! The ability to download multiple files at the same time is amazing. I can enter up 5 – 10 SSN’s at one time, and in the background while I’m working on other things, these files download. Quietly, seamlessly, and efficiently. I have been using this for the past year and it works wonderfully. The hyperlinks in the “Table of Contents” generated by the program and the automated pagination, bolding, and bookmarks by this software is amazing! It does in moments what I used to spend a lot of time on. I have always used Adobe Acrobat Standard or Pro since the Agency became paperless for the ability to search the documents. The TIFF files are useless to me and this product converts them like magic. Fast and friendly support seals the deal. Easy to download and get started in a few minutes. This is the easiest product to use to convert the SSA files to PDF. I have been using it for a while now. I love this product. I have one small issue with the beta converter. It is too tall to fit my screen and I have to move it up to see the next button. That is the only thing about this I would change. Anytime I have to call regarding getting it re-loaded on my computer your staff is very helpful and freindly. Thank you for making my job easier.